Dukane has been around since 1922, first as an audio-visual equipment pioneer and later using the new field of ultrasonics for NASA and airline industry (pingers for “black-boxes”) and in 1969 ultrasonics for the plastics industry. Dukane has offered many “firsts” in the industry, but nothing compares to its introduction of the first standard, industry ready and available SERVO ULTRASONIC WELDER. After years of development, Dukane launched the servo welder in 2009. The response has been overwhelming. So much so, that nearly 50% of our sales of ultrasonic equipment is servo based. We also still offer our traditional pneumatic power drive units, complete with advanced features including load cell triggers, weld by distance, energy or time, and medical configurations ready for validation. 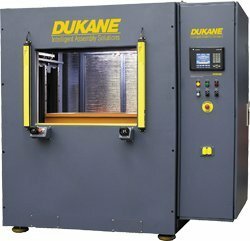 Dukane offers a complete line of “Large Format Plastic” Assembly Equipment including hot plate and vibration welding. Our application labs – both in Connecticut and Illinois – is an invaluable asset to assist you in development of your process or to help you troubleshoot in the field difficulties. We offer a 24 hour support system, including but not limited to loaner equipment, repair parts and services, and calibration services. Our patented “Melt-Match” technology in the iQ Servo system has been an industry blockbuster. Independent studies have shown an improvement to 5.1% standard deviation for weld strength with the servo welder compared to 9.4% with a pneumatic welder. A study for standard deviation of a hermetic seal via weld shows the servo at 0.4%, while traditional pneumatic welder yield a standard deviation of 2.9%! That’s right – an almost 90% improvement! Can you imagine increasing your confidence in your process by almost 90%?? ?